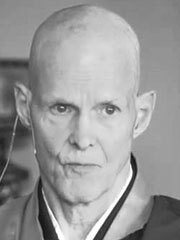 Tenshin Reb Anderson, roshi, is a noted American Zen Buddhism priest and teacher in the Soto school. Raised in Minnesota, he became a Buddhist in 1967 and studied with Shunryu Suzuki at the San Francisco Zen Center. He was ordained as a priest in 1970, receiving the name Tenshin Zenki (Japanese for «naturally real, whole activity»). In 1983, Anderson received dharma transmission from Suzuki’s successor Richard Baker. Baker would later argue that the dharma transmission process was never finally completed as he did not give Anderson all the minor documents (kiragami) associated with Japanese Soto. However this assertion has not been accepted within the mainstream of North American Zen where Anderson Roshi is considered a major figure. Anderson served as teaching abbot of the San Francisco Zen Center, individually from 1986 to 1988 and with a co-abbot from 1988 to 1995. He lives with his family at Green Gulch Farm, part of the San Francisco Zen Center, where he continues to serve as the Center’s senior teacher. You have to sit with your life and feel how you hold it, and be willing for the release to happen. It will happen spontaneously, because it’s already so. At the conventional level, the precept of no intoxicants is understood as encouraging us to control our behavior by not using addictive substances to manipulate our state of being. Ironically, using individual effort to try to control our behavior is itself a violation of the ultimate meaning of the precept, because it is akin to manipulating our experience. Completely trusting a way that you can’t do by yourself, that you do with all sentient beings, is immediate liberation. Helping others entails learning how you are helped. In order to heal others, you must learn to heal yourself. Learning how to give to yourself is part of learning how to give to others. If you are stingy with yourself, you will be stingy with others. When you understand how everything is given to you, you will be able to give everything to others. Every manifestation of your body and mind is life.